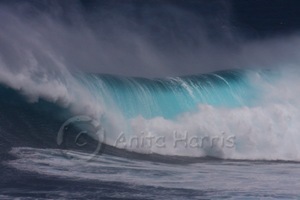 Big waves again at Jaws this week, unusually late in the season! 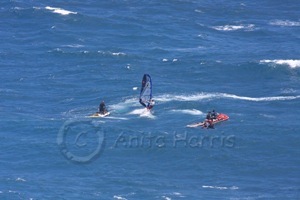 And with lots of wind this time – for the windsurfers.. No surfers this time, too windy! 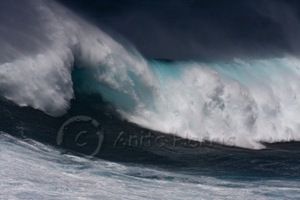 The wind and waves were accurately predicted for Tuesday this week, and sure enough the forecast was spot on.. Cameras were at the ready on the cliffs, eagerly waiting for the windsurfers to arrive on their jet skis any time after 9.30am.. By 11am the first arrived (Bart De Zwart) a good friend for many years arrived first, with his windsurf board and rolled up sail across the back of the jet ski. 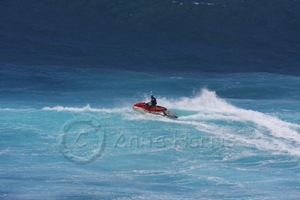 Rigging the sail from the back of a jet ski was tricky says Bart, but he managed it.. 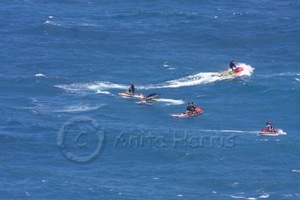 It wasn’t quite so easy for Diony Guadagnino, his sail blew into the water from the back of the jet ski, while on route to the Jaws surf break from Maliko Gulch (the launch site). The wind was so strong he was really lucky to have been able to retrieve it and without further delay joined Bart at the reef. 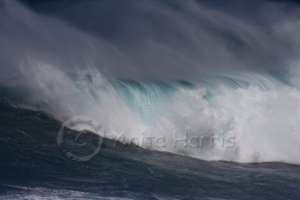 Bart had already started windsurfing the waves, a little tentatively at first,, but he soon loosened up and got right into it… It was so amazing and very entertaining to watch. 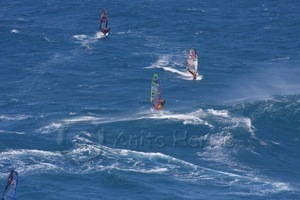 I have been to Jaws and seen surfers riding those waves many times, but windsurfers Jaws, that was a first for me too.